Rickie Lambert continues to prosper in an England shirt. The Southampton striker scored the winner against Scotland last month and played a key part in England's 4-0 win over Moldova in a World Cup qualifier, scoring once and setting up two goals for his strike partner Danny Welbeck. 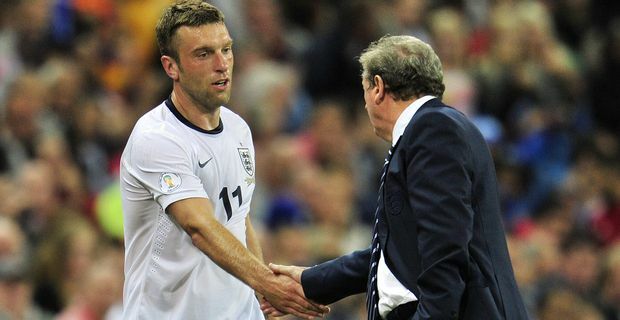 Lambert was even paid the compliment of being substituted in the second half, suggesting that manager Roy Hodgson wants to preserve his energy for the crucial match against Ukraine. Hodgson is running out of strikers. Injuries to Wayne Rooney and Daniel Sturridge were compounded by the suspension of Welbeck, harshly booked for shooting after the referee blew for offside. It didn't help that his previous booking in the qualifiers was another unfair decision when the referee believed he had dived against Montenegro. "It was difficult to get my head right after that, knowing I wouldn't be taking part in the next game," Welbeck said, "but I wanted to play my part for the team and make sure we got the result." Two goals were the perfect response. The habitually mild-mannered Hodgson was incensed by the decision, and admitted that it was the last thing his depleted squad needed. "It doesn't get much more unfortunate than that," Hodgson said, sounding like Gregg Wallace from Masterchef. "The booking overshadowed the win, that's for sure. We were already very short of front players anyway. But we're getting used to dealing with misfortune. He's out of the game. We'll live with it, deal with it, but I didn't think it was a correct decision." A sense of grievance might help England as they seek to see off the challenge from Ukraine. England's 4-0 win was eclipsed by Ukraine's 9-0 demolition of San Marino. Elsewhere in the group Poland's draw with Montenegro left England at the top of the table by a point, but there is plenty of work still to be done to book a trip to Brazil next summer.